Dr. Ayad Gharghoury graduated from the Universidad del Noreste and completed his residency program at the Rutgers New Jersey Medical School. Then, he did a fellowship at the California Pacific Medical Center. Dr. Gharghoury is specialized in Pulmonology and board certified in Pulmonary Disease. 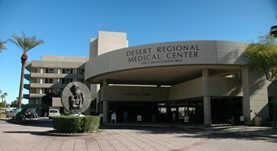 He has been in practice for more than 20 years and is affiliated with the Desert Regional Medical Center.